You can also put it to work with your bass down to the open A string as well as keyboards. 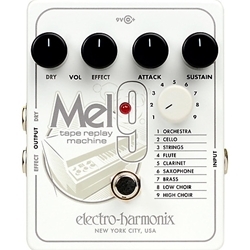 The MEL9 includes independent Effect and Dry volume controls so you can create the perfect mix at the Effects output with a Dry Output jack to output your input signal at unity gain. The Attack control sets the volume swell speed. As it's turned clockwise the notes fade in more gradually, while the Sustain control adjusts the release time after a sound is stopped. As it's turned clockwise, the fade out time increases. Dimensions: 4.0 (w) x 4.75 (l) x 2.25 (h) in.